West Ham needed a late Ricardo Vaz Te goal to salvage a point against Watford as they blew their chance to go top of the npower Championship. The Hammers, needing a win to leapfrog Southampton at the summit, created a host of chances only to fall behind to a second-half sucker-punch from Watford teenager Sean Murray. Substitute Vaz Te struck with three minutes of normal time to play and West Ham laid siege on the Watford goal throughout nine minutes of stoppage time following a nasty injury to Dale Bennett. Manager Sam Allardyce felt they should have had a last-gasp penalty as the final whistle approached when Carl Dickinson appeared to handle. But an expectant crowd, anticipating a comfortable home win against a side they had beaten 4-0 in August, had to settle for a point. Matt Taylor was back in the West Ham line-up after a three-match ban and looked determined to make up for lost time, crashing a shot against the crossbar from 30 yards with less than a minute on the clock. It set the tone for the match with Julien Faubert then missing a gilt-edged chance when, six yards out at the far post, he sidefooted the ball back across goal. The Hammers twice opened up a stubborn Watford defence just before half-time, only for Tomasz Kuszczak to come to the visitors' rescue with saves from Mark Noble and James Tomkins. The hosts began the second half in the same vein, Tomkins heading Noble's cross into the ground and over the bar after just two minutes. 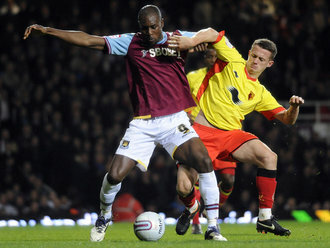 Moments later, as three Watford players threw themselves in front of Joey O'Brien's shot, defender Bennett came off worse in a clash of heads with team-mate John Eustace. Eustace returned to the field in a heavy bandage but Bennett received lengthy treatment on the pitch before he was gingerly carried from the field in a neck brace. Allardyce sent on Sam Baldock in a bid to pep up his misfiring attack, but instead it was Watford who took a shock lead. There appeared to be little danger when Murray collected the ball 20 yards out to the right of West Ham's penalty area, but the rookie midfielder lashed a fierce low drive across Green and in off the post. Watford promptly retreated back into their own half and Faubert fired over, Nolan shot wide and Kuszczak pushed a Vaz Te header wide. But from the resulting corner Vaz Te fired goalwards and the ball squeezed over the line, via the far post, before Kuszczak could react. There was still time for the Hammers' penalty appeals to fall on the deaf ears of referee Keith Stroud to leave them contemplating a missed opportunity in the title race. West Ham Green, O'Brien (Lansbury 74), Tomkins, Faye, McCartney, Noble, Nolan, Taylor (Vaz Te 74), Faubert, Maynard (Baldock 62), Cole. Subs Not Used: Boffin, O'Neil. Watford Kuszczak, Doyley, Mariappa, Bennett (Taylor 58), Dickinson, Murray (Buaben 88), Hogg, Eustace, Kacaniklic, Deeney, Iwelumo. Subs Not Used: Loach, Trotta, Garner.